It is important to understand that reviews here are all Google approved and collected by a third party. This ensures that what you see are verified customers giving their honest opinions. our Facebook page, Instagram Page, Twitter Followers, and see all of our awesome followers there. We invite you to share your review with us on one of these platforms. 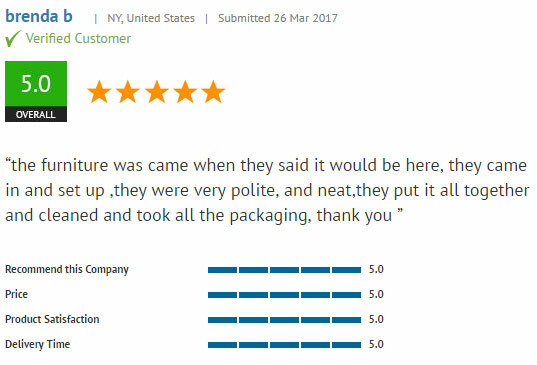 Write a review once you receive your item. Is it comfortable? Sturdy? Was it packaged properly upon arrival? Whatever the case may be, please share your thoughts. Your opinion matters and we value your feedback. “How do I submit a review?” It’s easy! 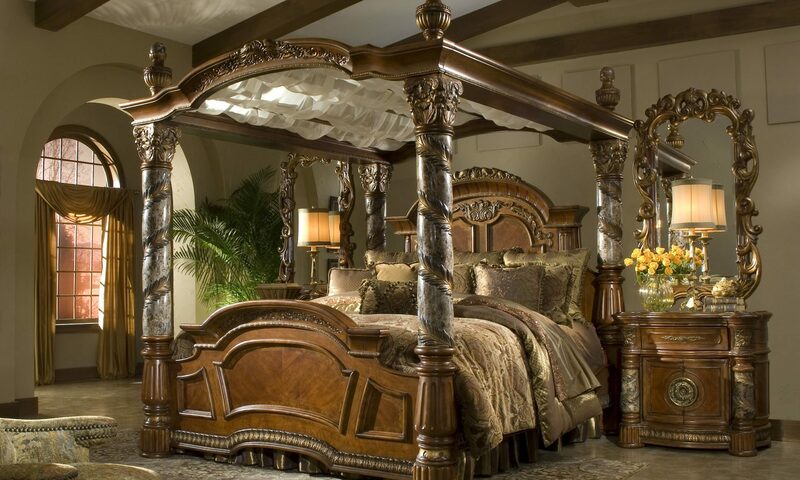 Go to GreatFurnitureDeal.com and locate the product you purchased. Once you have located the item, click on the title of the item. Clicking on the title will bring you to the main product description. Within the description, click “Add Review.” That’s it! Now you are ready to submit reviews on the Great Furniture Deal website. 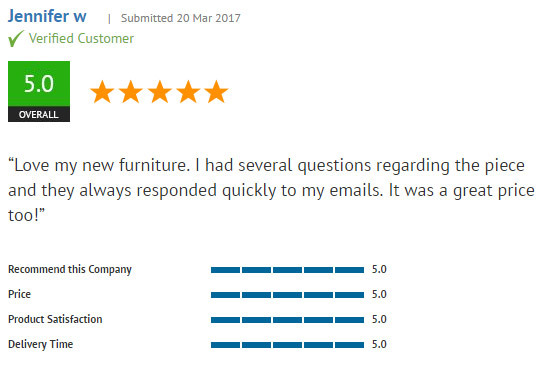 Why Write a Review for GreatFurnitureDeal.com? “Why should I write a review?” When you tell us what you think of our products, we can see what we have done right and also understand what we need to work on. If we do not know any of these things, how can we continue to serve you to the best of our ability? For us, selling furniture is about YOU, so don’t let us lose out on hearing what you have to say. 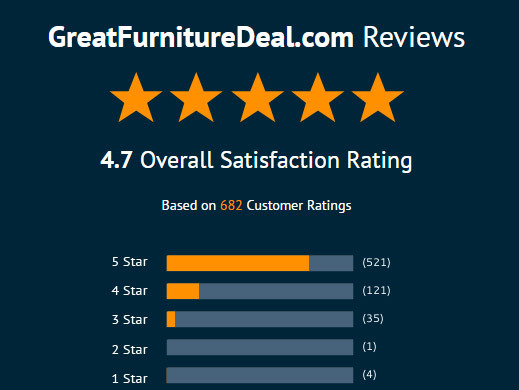 Start submitting GreatFurnitureDeal.com reviews each time you make a purchase. Now that you know the who, what, how, and why’s, let us share some GreatFurnitureDeal.com reviews we’ve received. See what others say about our quality and discounted furniture for yourself. Carol J. Our furniture arrived today and it is fabulous. My husband and I were skeptical about ordering furniture online. The furniture arrived and was packaged very well. It could have gone to London it was packaged so well. I will refer others to your site and we will continue to buy furniture from you. The communication between us, Great Furniture Deal and the shipping company was also fabulous. I bought this for my newborn’s room and it is absolutely perfect. It was delivered assembled and is quality and gorgeous. I was pleasantly surprised. For the price, I expected it to be cheaper made. Highly recommend for any modern home. 5 stars!!! You will get a lot of compliments, really beautiful and great quality. The recliner is beautiful! Nicer then we expected. We received it about 5 weeks after we ordered it. The quality is awesome, it’s nice and big! Everything we wanted and more! Thanks great furniture deals!! Great looking piece…already assembled…love it!! I love this set! It was a great deal, much better than my local shop. Wow – I have looked all over for something that matched my dining room chairs and shelves. When I found it the price was extremely expensive. Great Furntiure had a great sale – did quick shipping, called me to make sure that if the box was damaged to note it and made sure I knew when it was coming, the communication and the order was flawless. Great deal, great doing business with. We have 6 children and 2 dogs…we needed something large enough for EVERYONE! There are several things that we considered when choosing this sectional: The price, the warranty and the service. The price fit our family budget…AND it’s leather! The warranty was a must …6 kids…need I say more? And it was inexpensive. I know that if ANYTHING goes wrong…we just need to call. The customer service was incredible. We had SOOO many questions and they were able to help with every question. We also chose to have it delivered curbside to save on shipping. The pieces were manageable with one of my teen boys and husband. Assembly wasn’t hard either! The leather cleans up nice, it’s comfortable and looks beautiful. We love our new sectional. Ready to make a purchase with us? Once you do, remember to write a review! GreatFurnitureDeal.com reviews help us give you the best products and prices. If you would like more information on how to submit a review on our site, live chat us, call us directly, or just send us an email. Want to save some cash? “Like” us on Facebook and receive $20 off your next purchase!